For a list of my DIY tutorials with basic supplies and instructions click here. Hopefully your inspired to reshape your own "trash" finds. Good luck. thanks, you can see a list of my DIY tutorials in the upper tab that have clear instructions and basic supplies. adore this! Simply love how it turned out - thanks for sharing! 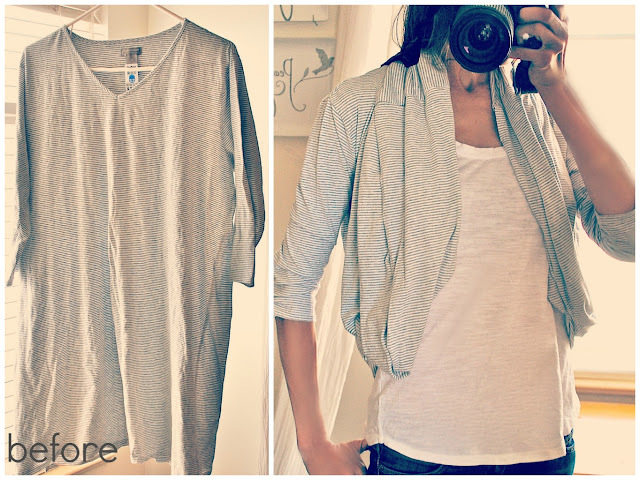 Super creative, I really need more cardigans too, and I love that it was made from something not so beautiful. Great idea! If you could, I would love to know how you made it, I mean I've done some sewing, I'm not as amazing as you, but I would love to try to recreate it somehow! Really great, thanks for sharing, and I can't wait to see what else you have to share. I LOVE this!!! Could you PLEASE PLEASE post up more pics so I can try to figure out how you did it? Oh my goodness, I love your stuff! I know this is from way long ago, but I was just looking for a t-shirt restyle for something really big, and came across your blog and have been looking through it all :) This is freakin adorable! I couldn't resist following :) Thanks! Amazing!!! ..as everything you've made! Thanks for inspiration..